Isn't she just a peach? If ever there were a case of someone born on third base and thinking they hit a home run, here you have it. This delightful person knows even less about the middle class or poor than Mitt Romney, yet she has all of the answers. Plenty of people - rich and poor - work hard, but not everyone was born with wealth the way she was. This is on a par with Mitt Romney telling kids that everyone is already able to go to college and start their own business, just borrow money from your parents - as if everyone's parents, especially in this economy, have a secret stash of $100,000 to pay for the kid's college and a start-up business. Sorry Mitt, just your family. And hers. "If you're jealous of those with more money, don't just sit there and complain," she said in a magazine piece. "Do something to make more money yourself -- spend less time drinking or smoking and socialising, and more time working." 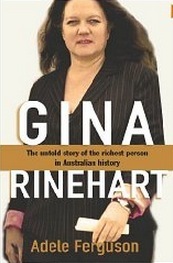 Rinehart made her money the old-fashioned way: She inherited it. Her family iron ore prospecting fortune of $30.1 billion makes her Australia's wealthiest person and the richest woman on the planet. "There is no monopoly on becoming a millionaire," she said by way of encouragement.